This wine is great value. You might expect that it would be some poor echo of an Appellation Controlee Cotes du Rhone. While the wine is similar in character, that is not the whole story. This wine has a pleasant open taste and lots of fruity flavour. 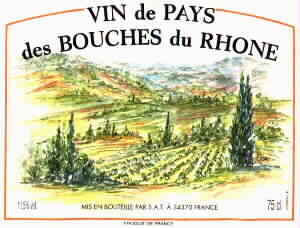 It is a light and simple wine as is usual for French country wines. Unlike many though, the balance of acidity is spot on. Enough to keep things interesting but not so much as to make the wine taste too sharp. It's a good wine to buy for everyday drinking.